Beat the heat with this bright and refreshing vegan chilled soup that will transport you to the enchanting open-air pavilion of Herb Library in Ubud, Bali. This past week brought some hot and humid days, a little reminder that the dog days of summer have arrived in Chicago. Naturally, I found myself wanting to be cooler and craving the creamy, chilled carrot and healing roots bisque I enjoyed when Wally and I dined at Herb Library in Ubud, Bali this past spring. Their menu is an extension of the Alaya Jembawan Resort’s wellness concept and features healthy and delicious options. The bisque was silky smooth, light and delicious, like the brightness of the Balinese sun in a bowl. Ginger, galangal, garlic and earthy turmeric give the soup its complex layers, while carrots serve as the foundation. Carrots are high in beta-Carotene, which works inside our bodies as an antioxidant, while ginger, galangal and turmeric purge toxins and reduce inflammation. Plus, with a bit of prep, these nutritious ingredients cook up quickly, and when blitzed in a blender, give the soup a velvety texture. This recipe was kindly provided by Herb Library’s executive sous chef, Wayan Adhe Suwetha. The soup is substantial enough on its own, but can be served with crostini and a mixed greens salad. I like to finish mine with a good dollop of plain yogurt or swirl of coconut milk to round out the flavors. Melt coconut oil in a large pot over medium-high heat. Add the whites of green onions, ginger, galangal and garlic. Sauté 2 minutes, until glossy. Add carrots and spice mixture. The kencur is optional but adds another layer to this soup. I purchased mine online through Épices de Cru. Sauté 1 minute, stirring to coat carrots. Add 4 cups water and bring to a boil. Reduce heat, cover partially and simmer until carrots are very tender, about 20 minutes. Cool slightly. Purée soup in batches until smooth. Season with salt and pepper. I recommend making it a day ahead — that way you get more depth of flavor and it’ll be properly chilled. If the soup is too thick, thin with more water. Ladle into bowls. Serve with crostini and salad. Preheat oven to 350ºF. Mix in chives and garlic to melted butter. Brush both sides of bread with butter. (Try olive oil instead to keep this recipe vegan.) Place in a single layer on a baking sheet. One of the more flavorful (and seemingly bizarre) soup recipes, this Indian dish has many variations. Here’s our favorite. The British aren’t known for their culinary skills. Sure, they can whip up a myriad of delicious cakes, as The Great British Baking Show has taught us. But when it comes to meals, the Brits are about as bland as can be. My Welsh grandmother once told me, “The only spices you need are salt and pepper.” I disagreed, and with the rise of curry shops around England, the British seem to have come around as well. It’s strange to me that a country that colonized so many parts of the world took so long to add bold flavors to its cuisine. When you try mulligatawny soup, there’s no denying it’s an unexpected but delicious blending of British and Indian culinary styles. Indian meals are traditionally served all at once, the containers placed in the center of the table, family-style, with everyone digging in and helping themselves to the shared dishes. During the British Raj, between 1858 and 1947, when the sun never set on the British Empire, the fussy British colonists and soldiers refused to alter their way of dining, which I’m sure they felt was much more civilized. And that included a soup course. Well, there wasn’t really an Indian soup, per se, so the servants would water down one of their occupiers’ favorite dishes, milagu tannir, which translates to “pepper water” in Tamil, a southern Indian dialect. (One source says the dish was molegoo tunes, a broth drunk by poor Sri Lankans.) The British never seemed to worry about pronouncing things incorrectly, and they garbled the dish until it came out mulligatawny, as it’s known today. The colonists brought mulligatawny back to Britain, where it’s a staple on pub menus, though the recipe varies widely. We’re partial to the version my mom makes. Put oil and butter in a skillet until it melts. Sauté onion for 4-5 minutes. Add garlic, sautéing for 2 minutes. Add the rest of the ingredients to a large pot, except the heavy cream. Cover and simmer. Ladle out some of the warm liquid and slowly add the heavy cream while stirring. This will help prevent the cream from curdling. Add it back to the pot and cover. Simmer for at least an hour. The longer the better. Serve with fresh parsley (and a dollop of sour cream if you’d like). Back in the day, the heavy cream was coconut milk, so feel free to substitute that. Also known as chole, this Indian recipe will satisfy your craving for curry. Wally and I can’t get enough of spicy food. Our favorite cuisines employ heat as part of their flavor profile, and neither of us can resist a good curry or salsa with a bit of a lingering heat. In fact, when we cook from a recipe, we always double the spice. As temperatures drop, I find my mind wandering off to the memory of Wally and I eating the most delicious chana masala at a dhaba, a roadside restaurant, on our return from the Ajanta Caves in Maharashtra, India. The nourishing, flavorful stew, made with chickpeas and diced tomatoes, is a simple, adaptable dish. It's begun like most curries, with garlic, ginger and onion, simmered in an aromatic mixture of traditional Indian spices like cumin, garam masala, coriander and turmeric. An ingredient worth adding to your pantry, and what gives channa masala its sour citrus note is amchoor powder, a tart and earthy spice made from dried unripe green mangoes. You can order amchoor powder here, or substitute with a squeeze of lemon juice. Top the chana masala with a dollop of cooling yogurt and serve with naan or basmati rice. Ours gets heat from serrano chiles, but if you’d prefer something less spicy, simply omit one of the peppers. Put the chickpeas in a large pot and add enough water to cover them by 3 to 4 inches. Soak the beans 8 hours or overnight. Drain the chickpeas in a colander and rinse well under cold water. Add them to a large pot, cover the beans with several inches of water and bring to a boil. Reduce the heat to medium-high and cook until the chickpeas are tender, 1 to 1½ hours. When the chickpeas are mostly tender, add a few large pinches of salt to the pot. Drain well, rinse with cold water to stop cooking and transfer to a bowl. Purée the ginger and garlic in a food processor until it forms a paste. Heat oil in a large pot over medium-high heat. When it’s hot, add the onions and season with salt, stirring occasionally, until they begin to soften, 3 to 5 minutes. Add the turmeric and diced serrano peppers and continue cooking until the onions are caramelized, about 5 to 7 minutes. Add the garlic and ginger paste, stirring occasionally, for another 2 minutes. Add the chickpeas, tomatoes, chana masala spice mixture, garam masala, cumin and sugar. Cover and simmer over medium heat until the chickpeas are tender and the mixture has thickened slightly, about 30 minutes. Stir in the amchoor powder and lemon juice. This recipe for Thai tea is perfect for hot days and sweet tooths. In Thailand, iced tea isn’t served unsweetened with a lemon wedge. Known as cha yen, it’s more of a caffeinated dessert: a mixture of black tea, sweetened condensed milk and ice. I’m a fan. I mean how can you not have Thai iced tea when in Thailand? I enjoy it so much, I hunted down the recipe so I could have it even when I’m not in Thailand! The exact origins of Thai tea remain a mystery, but some historians believe it to be a lingering influence from Field Marshal Plaek Phibunsongkhram, a former prime minister of Thailand with a penchant for Western culture. The tea became a staple of Thai street food culture, sometimes spiced with star anise and orange blossom water, but more often than not, served without any additional flavorings. As the climate in Thailand tends to be hot and humid, tea is often drunk cold with ice. Sweetened condensed milk was most likely introduced during the Colonial era and grew in popularity since it keeps without refrigeration. Many Thai restaurants in the U.S. use an instant mix that contains the artificial food coloring FD&C Yellow No. 6 in the mix, also known as sunset yellow. It’s derived from crude oil, which gives it that bright orange hue, and incidentally, it’s the same dye that gives Kraft Mac & Cheese its trademark color. No thank you. This version has a distinctively floral and spicy flavor, sweetened by a blend of condensed and evaporated milk. The sum of the parts isn’t overly sweet but quite rich, ideal in small doses. It’s one of those recipes that’s surprisingly easy to make, and once you get the basics down, you can adjust the flavors and concentration the way you like. The tea base and spiced syrup can be kept refrigerated for up to a week. Bring sugar and 1 cup of water and to a boil. Simmer for 10 minutes in a small saucepan, stirring to dissolve the sugar. Remove the pan from heat and add star anise, cardamom seeds and cloves. Let sit for 20 minutes until flavors are infused. Strain mixture through a fine mesh sieve into a small bowl. Put in fridge. Add 10 black tea bags and 7 cups cold water to a large pitcher. Chill for 8 hours to overnight. Pour chilled syrup into pitcher. In a small bowl, whisk together sweetened condensed milk and half & half. Add ⅛ teaspoon vanilla extract. Add to the tea in pitcher. A cookie recipe that’s sure to brighten your day. Springtime weather in Chicago can be wildly unpredictable at best. Sure, you made it through winter, but March often throws a combination of wind, rain and, more than occasionally, snow our way. Days can vary from sunny and warm to cold and rainy up until the end of May, before summer officially arrives. Recently, on one of these blustery and chilly early spring days, I was humming “Holiday” by Madonna and daydreaming about a faraway rooftop bar with vibrant pink bougainvillea in bloom and the delicious, bite-size, toasty, golden coconut macaroons with soft chewy centers we were served at Palais Amani in Fès, Morocco. This simple recipe, adapted from Ina Garten, is bound to make your day better. It always reminds me of the ones we enjoyed on a warm and sunny afternoon on our spa day in the historic medina. A perfect combination of toasted coconut, meringue-fluffy egg whites and sweetened condensed milk yield a dense and slightly tangy interior. These confections are not to be confused with macarons, the meringue-based French cookie filled with buttercream, ganache or fruit curd. Combine the coconut, condensed milk and vanilla in a large bowl. Drop the batter onto sheet pans lined with parchment paper using either a 1¾-inch-diameter ice cream scoop or 2 teaspoons. In the mood for tapas? Don’t forget this tasty comfort food side dish. Every now and then, Wally will ask if I’m planning on making tapas. 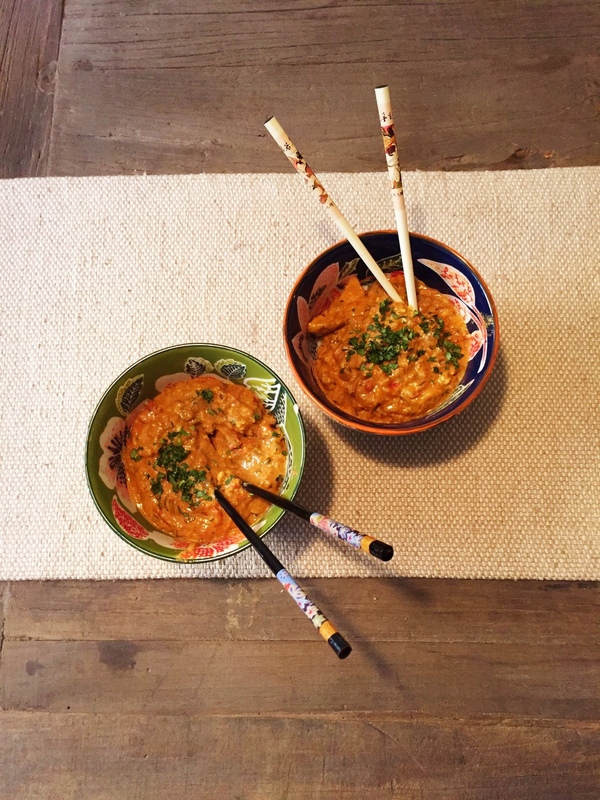 Like the cashew curry chicken, this recipe transports us back to one of our most memorable destinations. I have a couple tried-and-true recipes for tapas, one of them being patatas bravas. There's something comforting and magical that happens when hot crispy golden potato wedges are topped with a smoky tomato sauce. A tapas mainstay in Spain, patatas bravas, or “fierce potatoes,” are one of our favorites. I recently started baking these in the oven and like the texture the potatoes get. It’s lower in fat than frying them, and there’s no oil splatter to clean up, which is a win in my book. This recipe yields about four servings and makes a lot of sauce, which you can use on eggs the next morning. I use a 14.5-ounce can of Muir Glen Organic Fire Roasted Diced Tomatoes, as I like the texture and flavor. Add potatoes and cook for 5 minutes. Do not overcook. Pour potatoes into a colander, rinse with cold water to stop cooking, and let dry. Toss potatoes with 3 tablespoons olive oil, salt and garlic powder. Scatter on a sheet pan. While the potatoes are baking, prepare the sauce. Heat 1 tablespoon of olive oil over medium-low heat. Once hot, add the onion and sauté for 6-8 minutes, stirring occasionally until onions are translucent. Add the garlic and stir for 30 seconds, then add spice mixture of smoked paprika, cayenne and garlic powder. Cook for 2-3 minutes more and let cool. Remove potatoes from oven and sprinkle with a bit more salt to taste. Drizzle with tomato sauce. This standout Moroccan dessert comes straight from the chef of the Ruined Garden in Fès. During our trip to Fès we dined at the Ruined Garden twice. On our first visit, we did not save room for dessert, but when we returned, we chose the Chocolate & Espresso Mousse with Ras el Hanout. We were not disappointed. The mousse was the perfect size, too: little pots of rich, velvety mousse deliciousness with an unexpected exotic finish. Ras el hanout is a complex and distinctive North African spice mix. The name is Arabic for “head of the shop” or “top shelf” and consists of a combination of the best spices the merchant has to offer. Each shop has its own blend, the quantities of which vary according to the maker. I wrote to chef Robert Johnstone, who shared the recipe with us — and gave us the kind permission to run it on our blog. He makes 17 at a time, and the day before he serves them, he puts them in the fridge to set for a few hours. I scaled the recipe down and converted from metric to U.S. measurements. 8 (3-ounce) small espresso glasses or cups. Small is best, as the mousse is very rich. Heat the cream in a pan. Once it is just about to boil, turn off the heat and add all of the chocolate, espresso and instant espresso powder. Cover the pan and leave for 5 minutes or until the chocolate has melted fully into the cream. Then mix slowly but thoroughly. Try not to whip, as if you do the mixture will have bubbles — not a major problem, but they may spoil the finish. Once you think all is mixed, check by lifting the spoon out and looking at the texture on the back of the spoon. If you can see small grains of chocolate, the finished mousse will be grainy, so you should mix for a little longer, and the bits will disappear. While still hot, carefully pour the mixture into the glasses (we took Robert's advice to sprinkle a tiny bit of salt into the bottom of each glass in advance). Fill as close to the top as you can. Leave to cool a little, then put into the fridge overnight or for at least 3 hours. Finish with a dusting of any spice mixture you fancy as long as there’s a little pepper or heat — though we recommend ras el hanout, of course. You’re ready to serve! They keep for a week in the fridge. Cambodian food is one of our favorite cuisines, and this is our absolute favorite dish — a culinary reminder of a fabulous trip. Souvenirs of our various trips fill our home. But some of our souvenirs come in the form of food that evokes a meal we experienced and enjoyed abroad. This is a recipe adapted from Charmaine Solomon's Complete Asian Cookbook. The ground cashews, combined with the yogurt, provide a rich, creamy texture. Wally couldn’t believe how close it tasted to the meal we had on our Angkor Wat adventure. Theirs was served in a young coconut, though I dish it up in deep bowls with a bit a jasmine rice. Wally never fails to say, “This is delicious, as always,” then teases me by muttering under his breath, “Though it would have been even more delicious if it was served in a young coconut.” The brat. We find that this dish is even better if it has time to develop flavor overnight. So if you want to eat it the same night you cook it, just make sure you have enough for leftovers! Heat butter in a 5- to 6-quart heavy pot over moderate-low heat until any foam subsides. Add the onions, sautéing for 8 minutes. Add the garlic and ginger, stir, and cook for 2 minutes. Add curry powder, salt, cumin and cayenne and cook, stirring for another 2 minutes. Add chicken and cook, stirring to coat it with the spice mixture, for about 6 minutes. Add tomatoes, including the juice, and cilantro and bring to a simmer. Then cover, stirring occasionally, until chicken is cooked through, about 40 minutes. Pulse cashews in a food processor until very finely ground. Add to curry, along with yogurt. Simmer gently, uncovered, until sauce is thickened, about 5 minutes. Es la verdad. Wally’s famous guacamole never fails to please. Just make sure you get a molcajete. One of the most essential ingredients for guacamole is a molcajete — the mortar and pestle made of volcanic basalt first used by Aztecs and Mayas thousands of years ago. I went to a restaurant in Chicago and was served guacamole from a molcajete shaped like a pig. I decided then and there that I would one day possess one just like it. So when I stayed with my family in La Cruz de Huanacaxtle, Mexico one Christmas, I made it my mission to find a pig-shaped molcajete. I explored the market in Bucerías, the neighboring town, looking in each and every stall. As I neared the end of the market, I began to give up hope. Then, in one of the stalls, I saw a grouping of molcajetes. Alas, none of them were pig-shaped. And really, how could I ever be content with a regular one, knowing that there were pig-shaped ones out there? But then, sitting on the ground underneath one of the shelves, there it was. I bought it immediately, and lugged that heavy mofo back to the States. Would I ever serve guacamole in anything else? Maybe when pigs fly. Mix all the ingredients together in the molcajete. I leave half of an avocado to the end. That way you can have some chunks mixed in with the smooth texture. You do know the trick to getting the pit out of an avocado, don’t you? Slice it open lengthwise, then thrust your knife into the pit in a chopping motion. Turn sideways and pull it out. It doubles as a party trick and makes you look pretty badass. And yes, this recipe is a little spicy. But I can’t in good faith recommend cutting down on the spice level. Deal with it. Every time I’ve made this for people, it has gone over extremely well. I’ve even won dip contests at work with this recipe. Pair it with an all-natural margarita (though I'd try agave sweetener instead of maple syrup).